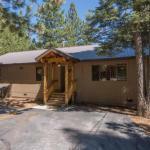 Set in Truckee 13 km from Northstar at Tahoe Resort 9 km from Donner Ranch Chair #1 and 9 km from Summit Chair Ramsey provides accommodation with a terrace and free WiFi. The property is 10 km from Mount Judah Express and 10 km from Jerome Hill Express. The holiday home features 3 bedrooms a kitchen with a dishwasher a washing machine and a bathroom. A TV with satellite channels is offered. Donner Ranch Chair #3 is 10 km from Ramsey while Christmas Tree Express is 10 km away. The nearest airport is Reno-Tahoe International Airport 43 km from the accommodation.